Hoka One One Arahi 2 maintains the stable, well-cushioned ride that the shoe debuted with last year, infusing lightweight cushion with support and stability. The upper fit is very similar to what I've experienced previously from HOKA, yet this year's Arahi is more breathable. 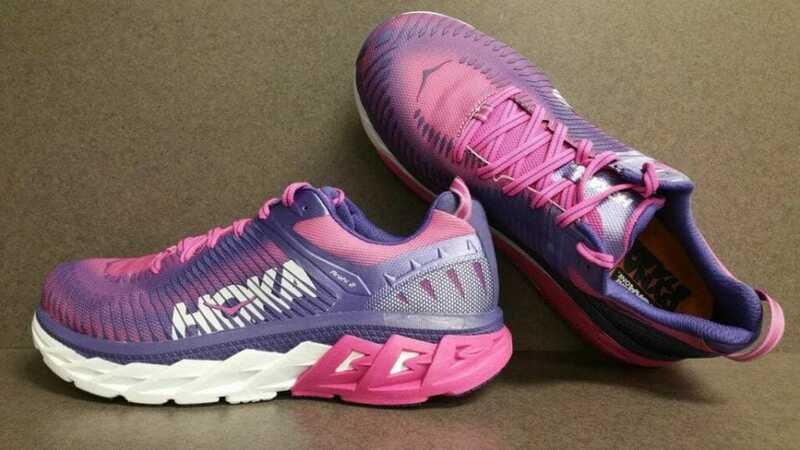 Arahi provides stability and a more durable, responsive sole unit for those who like the HOKA ONE ONE fit (roomy heel & toebox, more narrow midfoot) and thick cushion yet seek added structure. Immediately obvious upon unboxing was the less-plasticy looking upper; it’s a tight-knit mesh with an otherwise similar style. My 4-year-old didn’t miss a beat, calling them my “new tiger shoes,” which, that alone is a positive right off the bat. I was surprised at the stiff feel of the shoe. (Maybe spending all day in a 0° UPS truck had something to do with that), but I was eager to compare this second version with last year’s model. The ride is more responsive than I was expecting — I think I was remembering the Clifton. But unfortunately the reworked upper is not more accommodating to my medium midfoot. After the first 12 miles (in 3-4 mile runs), I thought it was a better fit, but with some longer runs and repeated days in them, the “pinched ache” on the lateral side made its return. See the “upper” section for more details. The top competitor to Arahi that I’ve run in is New Balance’s Vongo. Both shoes take unique approaches to stability with Arahi’s early stage rocker, which “rocks” you forward near the heel, and J-Frame, as contrasted with Vongo’s Varus Wedge midsole, which is thicker on the medial aspect angling down to a thinner lateral edge. Vongo’s upper fit better suits my foot: narrow heel, shallow toe box that accommodates my more medium foot toward the ball. But, I have to note that Vongo’s first version better stabilized my foot than Vongo 2. Arahi fits a narrow foot if you snug the laces and can accommodate a medium foot without pinching, if you don’t mind a touch of movement inside the shoe by loosening laces. 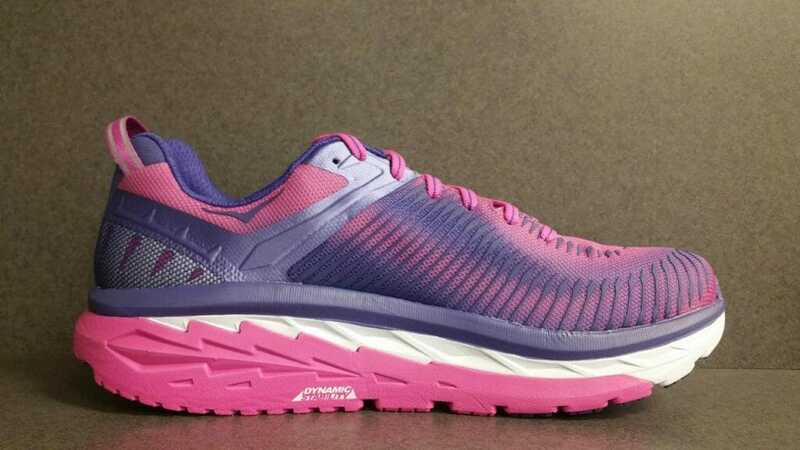 Brooks PureCadence is a competitor to Arahi that matches the drop height and comfortable sole yet presents a more fitted upper (with no lateral pressure) and minimal thickness of midsole: it offers a more connected running experience. In addition to HOKA’s standard wide base, Arahi features a more durable sole unit in key areas along the medial aspect and lateral heel, with the brand’s J-Frame midsole technology as well as more durable rubber in parts of the outsole. An important aspect toward durability is the firm rubber in the heel, which is primarily on the lateral aspect where shoes typically take higher wear, and covers the contact surfaces of the forefoot. Below a thin layer of cushy softness, a “J” of firmer-density EVA foam wraps around the heel and extends medially, keeping the shoe lightweight while allowing it to withstand repeated pounding. I notice a counter to overpronation from the tip of the J-Frame as I toe off. Arahi’s new upper material is more breathable, true to claim. I was so so hopeful that the reworked upper wouldn’t put pressure on my lateral midfoot, but the fit is very similar to the first edition. The pressure is slight but becomes more noticeable into longer runs. I can relieve it by loosening laces more than I prefer, but then I have to use the top laces to hold my heel in the shoe, since the fit here is loose. The take home is that the fit is best for a medium-wide heel into narrow midfoot, or a medium foot, if you don’t mind a little movement inside the shoe from loosened laces. The bold stripey pattern is similar to the debut model but with two reflective stripes on the heel loop—increased from one wider stripe in the first edition—and a reflective “sparkle” motif that encases more of the heel. It wraps around the sides as opposed to last year’s reflectivity being centered on the back. I started running in Arahi 2 a week before my annual Snow Scamper race in early February: a hilly trail race through the woods on a course that’s often covered with snow and ice. It turns out that there was enough snow for snowshoes this year—a race option, but I’d left mine at home—so I took on the challenge in Arahi 2, chosen for its wide base of stability to counter uneven footing. Thick sole to resist pokes from ice and sticks, and durable rubber patches along with deep treads on the outsole, for grip. The shoe performed superbly; I was happy with the decision. The new breathable upper became soaked through, however (as running in foot-deep snow will do). It’s not a great choice for wet runs. All in all, Arahi 2 is very similar to its first model in fit and stability but is built with a more breathable upper material. HOKA fans who want the more durable build of Arahi, should be very happy with this shoe. We purchased a pair of Hoka One One Arahi 2 from runningwarehouse using our own money. This did not influence the outcome of this review, written after running more than 50 miles in them. What’s the difference between Arahi 2 and Gaviota? I understand that both are Stability running shoes and my current pair is Newton Motion 6 that I love it. For weeks, I love it. Stability and responsive. 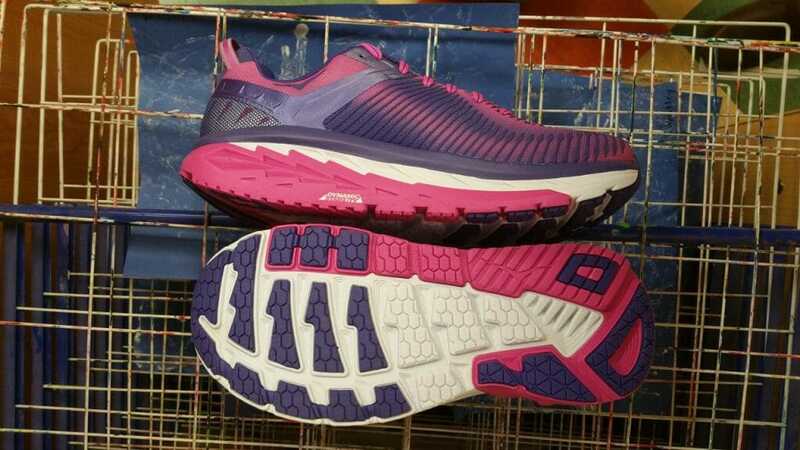 I have three stability shoes that are the latest version available right now; the brooks adrenaline gts 18, new balance 860v8, and this Hoka. 3rd place: Brooks- they offer very little stability and they aren’t the best at anything (for me.) 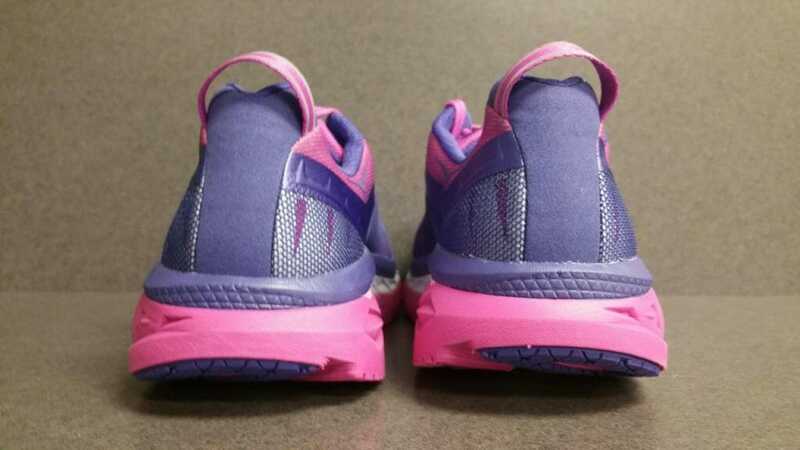 2nd: New Balance- best fit, most stabilty, highly versitle, but it’s the heaviest and least cushioned. 1st: Hoka- most cushioned + I’m just fast in these! The Arahi 1 is not well cushioned. It’s actually pretty stiff compared to other Hoka shoes. Did you find an improvement in cushioning with the Arahi 2? The Arahi 1 is actually quite cushioned. Sure it’s a little stiff the first run or so, but it is a stability shoe. After a few miles it softens up nicely and is actually quite cushioned. My favorite shoe to run being in now my 4th pair. I’m hesitating to pick up the 2’s because of Hoka’s track record of ruining a good thing and continue to look for the 1’s on clearance. The sole unit is the same in this second version. Great review, I m planning on buying Arahi 2 but I m not sure for the right size. At clifton 5 my size is 46. Do u think i should the same for arahi 2? I m running now with kayano 24 which is great but i cant speed up as much as i want. Do h believe arahi could help me at this problem or you suggest me to try something else? Stick with the same size in Clifton and Arahi. I do think that the rocker base and lighter weight will help you be able to speed up. If you like the thicker sole and lighter weight, but want a higher drop (closer to Kayano’s), try New Balance Rubix. Amazing! I have been running with stability models since 2013 for marathons and nothing was close to the Arahi 2! Thanks Hoka for this piece of art! The past years i was running with Lunarglide series and the Nike Zoom Structure 21, but the lightweight of the Arahi is incredible. The rocker propulsion does really works. I hope the arahi 3 comes with a knit upper, i still thinks the mesh they use a litttle too much “closed”. I really recommend if you like stability or if you are a neutral running of marathons and ultras. Im not sure whos rating brooks beast or adrenaline shoes anymore. Maybe they are being paid off or are getting a great individual model delivered to them but their quality has really gone down hill. I was a devoted brooks fan, but the last 3 pairs i have bought have had annoying issues. 1 had a complete break down in the heel area. 2nd one noticed they reduced the tongue size and obviously less cushioning leaving me sore most of the time. All 3 sqeaked unbelievably and jit just on wet floors they jad failures leading to the squeaking and they sucked on floors. If your very thin and dont have foot issues brooks would be a good choice but i think they have really gone down hill while price continues to go up.